It seems that the Government of Grand Cayman is now favoring a large cruise pier development and not some of the other proposals that could protect the island’s coral. The Cayman Compass is reporting that Government officials are now in favor of a large cruise pier to be built at Grand Cayman’s harbor area. Premier Alden McLaughlin indicated on Wednesday that if Grand Cayman wants to survive and continue to secure jobs for the future then a major cruise dock is needed. 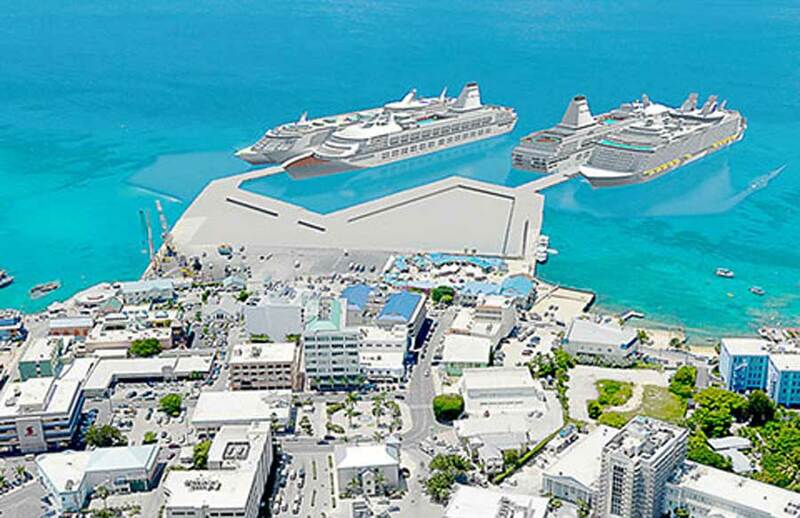 Authorities are aware that a new cruise dock which could potentially cater for 4 large cruise ship would destroy much of the coral reef near the harbor in George Town. An enhance cargo port could also be included in plans which are expected to cost at least $150 Million. With a green light for a new cruise port the Government will now move forward with discussions with cruise lines. All the parties involved will also work together on looking at different proposals that can benefit the island and the cruise lines. One of the most popular proposals so far has been the Cayman Skybridge where cable cars transport passengers from the ships to the harbor. The vessels would be anchored next to dock platforms away from the precious coral reef. What kind of cruise port would you like to see at Grand Cayman? Let us now in the comments below.